Transactions of all kinds enter the accounting system as entries in a journal, where they appear in the order they occur. Should anyone ask which transactions occurred on a given day, the journal provides the answer. What Is a Bookkeeping Journal? What Is a Daybook? In bookkeeping and accounting, a journal is a record of financial transactions, entered as they occur. "Transactions" and their entry into a journal are usually the first steps in the accounting cycle, as Exhibit 1 below shows. The exceptions are situations where entries are first captured in a daybook (or book of original entry) before they transfer to the journal. Historically, journals were always bounds as sewn-page bound notebooks in which bookkeepers hand wrote entries shortly after the firm closed a sale, incurred an expense, earned revenues, or otherwise impacted the firm's accounts. Today, of course, journals usually exist as part of an accounting system software application. Users, therefore, enter journal transactions either manually, through onscreen forms, or automatically, as with a point-of-sale system. Also, most accounting systems provide user guidance and error-checking to help ensure that entries register correctly as debits or credits in the appropriate accounts. And, the software also automates the second stage of the accounting cycle, posting journal entries to a ledger. The name "journal," from Old French and Latin origins, suggests a daily activity (jouris French for "day"). Personal diaries and newspapers are sometimes called journals for the same reason. While other accounting records may update less frequently, journals update either continuously or at least daily. As a result, the journal builds a running list of account transactions as they occur. Consequently, should anyone ask which actions happened on a given day, the journal provides the answer. Firms sometimes use one or more daybooks (or books of original entry) instead of the journal as the first data entry point for transactions. Entries in daybooks build in chronological order, just as they do in journals. Entries in the firm's various daybooks are frequently transferred to the firm's "journal," and then ultimately to the ledger. With daybooks, in other words, the journal becomes the second step in the accounting cycle, while the ledger becomes third. First, definining Journal, Daybook, and Book of Original Entry for bookkeeping and accounting purposes. Second, different kinds of Journal transactions. Third, contrasting Information the journal provides with information the ledger provides. What is a bookkeeping journal? And what is a daybook? What is the journal's role in the accounting cycle? What is a Daybook? Book of original entry? Why do firms use daybooks? Define your terms: Journal entry, debit, credit, and chart of accounts. Example journal and ledger entries. For more on the general ledger and ledger posting, see the article, General Ledger. For more on the role of journal and ledger in the accounting cycle, see the article Accounting Cycle. See the article, Double-Entry Accounting for an explanation of Debit, Credit, and Double-Entry Systems. 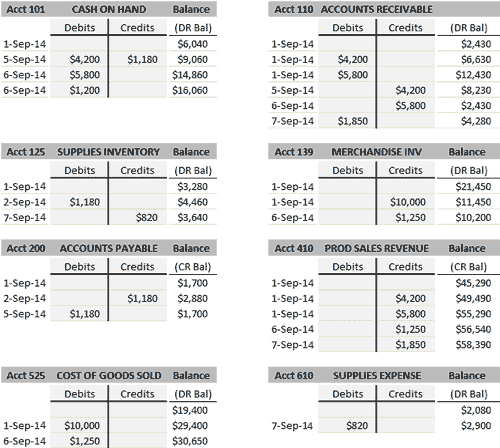 The article Account explains account categories and the chart of accounts. Most business firms record and report financial activity with a double-entry accounting system.Exhibit 1 below shows the significant steps in the accounting cycle for these firms. Note especially that the journal is the initial data entry point for transaction records. And, these records build ultimately into the firm's financial accounting reports at the end of the accounting cycle. Exhibit 1. The accounting cycle. Transactions enter the journal as the first step in the sequence. The journal builds into a chronological list, adding entries one after another in the order they occur. Journal entries transfer (post) to the ledger as the second step. At various times, accountants copy (post) journal entries to a ledger—another record book. While the journal lists entries chronologically, the "ledger" organizes entries by account, as Exhibit 9, below, shows. Near the end of each accounting period, accountants create a trial balance from the system's accounts, as part of an end-of-period check for accuracy. As a result, the trial balance should show that total debits equal total credits across all accounts. If the two totals do not agree, they make adjusting entries and corrections. Account names and balances then appear in the firm's financial accounting reports for the period. What is a Daybook? A Book of Original Entry? Why Do Firms Use Daybooks? A desire to put record capturing into the hands of people directly engaging in transaction activity. These may include salespeople, warehouse receivers, maintenance personnel, or customer refund agents, for instance. A need to capture additional information beyond the essential transaction details for the journal. Daybook entries may also include other data on customers, vendors, or the transaction event. A sales daybook for all sales transactions. A different sales daybook for each sales region. A cash daybook for keeping cash transactions together. Exhibit 2. below shows how the accounting cycle expands, slightly, when daybooks are present. Exhibit 2. The first accounting cycle steps when daybooks are present. Some transactions enter the accounting system through daybooks, while others enter the journal directly. Daybooks—when present—relate to the journal in the same way that sub-ledgers relate to the general ledger. Firstly, the daybook (or sub-ledger) has the same structure as its parent, the journal (or general ledger). Secondly, transactions appear first in the daybook and then transfer, later, to the journal. Thirdly, transactions post from the journal to sub-ledgers and then transfer, later, to the general ledger. Initial transaction data move more or less continuously from daybooks to the journal. As a result, daybook transaction data such as account name and number, transaction amount, date, and type (debit or credit), move to the journal. Daybook entries may also include additional transaction data that do not transfer to the parent journal, such as customer details, salesperson, or sales location. Capturing and preserving such data is the daybook's reason for being. In any case, daybook entries move to the journal in chronological order. And, in the journal, they appear as debits or credits to individual accounts from the firm's Chart of accounts. The basic building block of a double-entry accounting system is the account. An account is a record of the value and changes in amount for one specific purpose. When transactions enter the journal, those making entries are responsible for knowing which accounts to impact and whether the impacts should register as debits or credits. The firm's complete list of accounts for journal entries is called its "Chart of accounts." Every financial event impacts at least two of these from this list. And, the kind of effect (debit or credit) depends on which of five "Chart of accounts" categories has the account. In practice, even a small firm may list a hundred or more such accounts as the basis for its accounting system, while more complicated organizations may use thousands. Nevertheless, for accounting purposes, all accounts fall into one of the five categories above. Every financial event brings at least two equal and offsetting account changes. The change in one account is a debit (DR), and the impact to another is the opposite, a credit (CR). Whether a "debit" or a credit increases or decreases the account balance depends on the kind of account involved, as Exhibit 3 shows. Exhibit 3. Debit and credit impacts on account balance depending on which category holds the account belongs. Suppose, for example, a firm purchases an asset for $100,000. Two journal entries must follow. Firstly, a journal entry for the acquisition shows an asset account increasing by $100,000. This account could be an asset account such as "Factory equipment." Because this is an asset account, the balance increase is a debit. A "credit" of $100,000 to another asset account, decreasing its balance by $100,000. This account could be the asset account "Cash on hand." If instead, the firm finances the asset purchase with a bank loan, the offsetting credit entry in the journal could be a credit to a liability account such as "Bank loans payable." As a result, the credit transaction increases the account balance by $100,000. Double-Entry Rules Maintain Balance Sheet Balance. The bookkeeper or accountant dealing with journal entries faces one complication, however. Note that not all accounts work additively with each other on the financial accounting reports—especially on the Income statement and Balance sheet. In some cases, one account offsets the impact of another of the same kind. These are the contra accounts that "work against" others in their categories. In some cases, the contra accounts reverse the debit and credit rules in Exhibit 3 above. For example, "Allowance for doubtful accounts" and "Accounts receivable" are both asset accounts. Allowance for doubtful accounts, however, is also a contra asset account that ultimately reduces the impact (balance) of "Accounts receivable." When these journal entries make their way into the financial reports, the Balance sheet result is a "Net accounts receivable" that is less than the "Accounts receivable" value. In any case, those working with journal entries must be familiar with the firm's chart of accounts and have a solid command of double-entry rules. And, they should be using accounting software that provides clear guidance and careful error checking. Following sections illustrate journal entries and their contributions to the ledger, for a small subset of one firm's chart of accounts. Exhibit 4 shows eight of the firm's "accounts," which appear in this example. Exhibit 4. Eight "accounts" from one company's chart of accounts, to illustrate journal and ledger entries in the examples below. In reality, of course, the full chart of accounts, journal, and ledger will include many more "accounts" in addition to those shown here. However, for a week's activity in just the accounts above, journal and ledger entries might appear as follows. On 1 September, Grande Corporation has two customers place product orders, on credit. Customer 1 orders $4,200 in products, Customer 2 orders $5,800 in products. As a result, the company ships the products later the same day. Exhibit 5 below shows the journal entries due to these events. Exhibit 5. Journal entries due to two product purchases and product shipment on 1 September. On 3 September, the company places a $1,180 order for office supplies. Exhibit 6 below shows the journal entries due to this order. Exhibit 6. Journal entries due to two an order for office supplies on 3 September. On 5 September, a written check from Customer 1 arrives ($4,200), and the company sends its bank check to the office supplies vendor ($1,180) for the supplies order of 2 September. Exhibit 7 below shows journal entries due to these events. Exhibit 7. Journal entries due to revenue receipt and cash payment on 5 September. On 6 September, Customer 2 makes a credit card payment for the order of 1 September ($5,800). Also on 6 September, Customer 3 purchases products, pays in cash ($1,250) and takes delivery immediately. On 7 September, the firm notes that the supplies inventory has decreased by $820 worth of supplies since the last check of supplies stock. Also on 7 September, Customer 4 orders products on credit ($1,850) which do not ship by the end of the day. Journal entries due to 6 and 7 September events appear in Exhibit 8, below. Exhibit 8. Journal entries due to cash payment receipts, depletion of supplies inventory, and one new customer order on 6 and 7 September. It is easy to see on the journal page that every debit entry pairs with an equal credit entry. Notice, by the way, that the journal above follows the universal convention of listing debit figures to the left of their companion credit figures. From the journal page alone, however, it is not easy to judge whether the company is making money or losing money. That information is not completely visible until the end of the accounting period when account balances from the ledger are brought together for the trial balance. That information is partially visible, however, as soon as journal entries transfer (post) to the ledger. As a result of posting, account summaries show up-to-date account balances (e.g., balances for sales revenue accounts and expense accounts). As the second step in the accounting cycle, journal entries sometimes move first to various sub-ledgers (if the firm uses sub-ledgers), and then always to the firm's general ledger. The general ledger is the top level ledger, having an account record for every active account in the chart of accounts. Historically, when journals and ledgers were bound notebooks, and entries were handwritten, journal data were posted into ledgers only periodically. As a result, account balances were known only through the most recent posting. Today, however, accounting system software can update ledger accounts more or less continuously. As a result, account balances in the ledger are always current. Account summaries in the ledger usually appear in the form of T-accounts, as Exhibit 9, below, shows. The exhibit presents T-account excerpts for each of the eight accounts in Exhibits 4 - 8. They are "T-accountsbecause of the T-shaped lines that separate the account's debit entries from its credit entries. Again, debits always appear on the left, and credits appear on the right. Exhibit 9. T-accounts in the general ledger after journal entries been transferred (post) to the ledger.